ConVirt is a multi-tier web based application that allows provisioning, administering and monitoring virtualized environments. Easy to use yet remarkably deep and sophisticated, ConVirt is a single, complete solution whether you wish to manage a few Virtual Machines (VM's) on a single workstation, or 1000's spread across 100's of servers in a data center. All platforms for managed servers. But all these now are done using an interactive Web based user interface. Allows multiple administrators to manage the same environment. 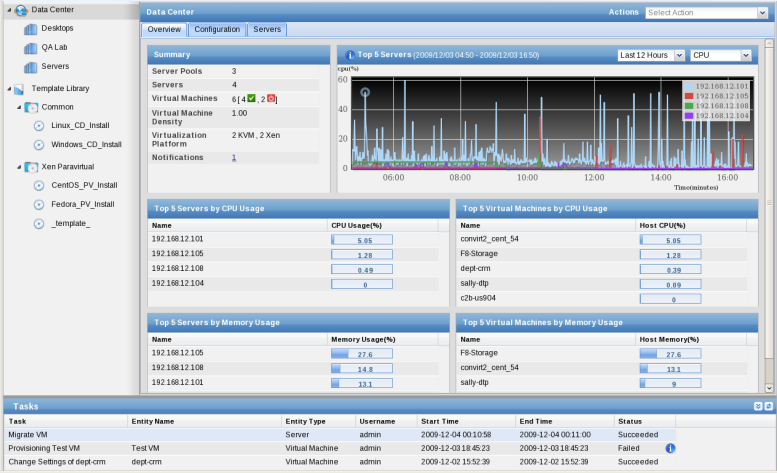 Provides historical measurements for Virtual machines and Servers. Task subsytem that performs background operations and other asynchronous activities. Lets take a detailed look at some of these features. Use Context menu on the entity to invoke the operation. For example, select a VM, right mouse click to get to the context menu and invoke the desired operation. 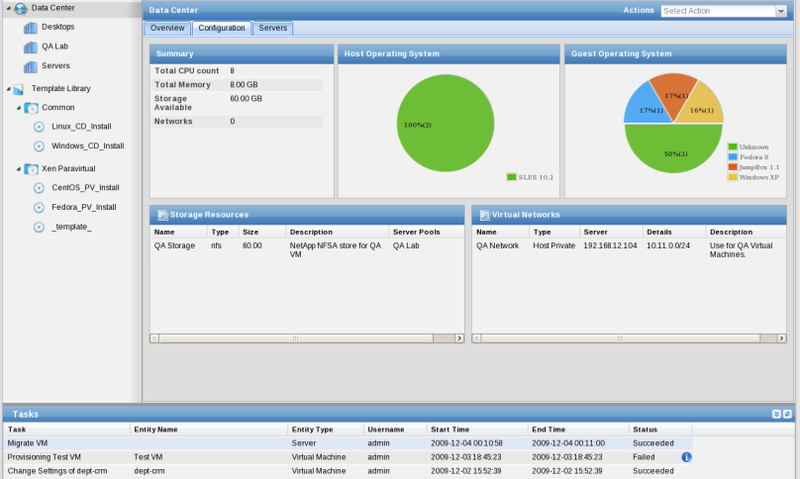 View and organize Servers in Server pools and see them hierarchically in the navigator. Search the Servers or Virtual machines by name and get to information about them. Sort the Servers and Virtual machines by their CPU or memory consumptions. Select area of the chart to zoom in and out. Get to the Virtual machine console from the browser via VNC. Allows the same environment to be managed by multiple administrators. The 'admin' user creates account for other administrators. Once this is done, the new administrator can easily manage the whole environment. ConVirt now has an information repository where all past measurement data is stored. The information is also periodically summarized on hourly and daily bases. There is automatic maintenance done on the repository to keep it in bounds. The data retention is also highly customizable to meet various requirements. This information is presented in various time series charts. The user can select various time windows and do comparison. This information easily allows you to see the trends in your data center. ConVirt has a task execution engine. All operations within ConVirt are carries out via this subsystem. It also runs periodic tasks of monitoring servers and virtual machines, data rollups and periodic maintenance. The information about the tasks submitted and their status is presented in the task pane at the bottom. ConVirt 2.0 presents data in an organized fashion. Each entity in the system has at least an Overview tab and a Configuration tab. The Overview tab shows summary information as well as information that requires attention. It also shows various charts that shows recent performance. The Configuration tab on the other hand shows configuration information about the entity. The following two screenshots gives a a clear idea of the philosophy of bringing the relevant information to the user. 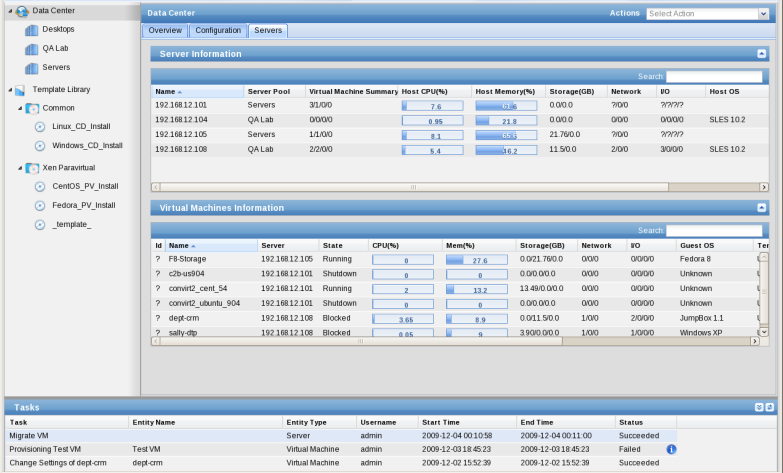 The Servers tab at the Data Center shows all the Servers and Virtual machines. These are sortable and searchable that allows you to find the information that you are looking for.